Swiss Made, featuring a Sellita Caliber SW500, 3-hand (hour, minute, chronograph seconds) automatic chronograph with date and 12-hour, 30-minute, and continuously running 60-second subdials. 44-hour power reserve - fully wound. "I'm absolutely in love with the Rebel-AC I got from LIV. The black case with orange highlights is done -just- right, and is well complemented by the default strapping as well. Can't wait to buy my second watch from them!" - Ken S. from the U.S.
Rebels shake things up and the Rebel AC is no exception. 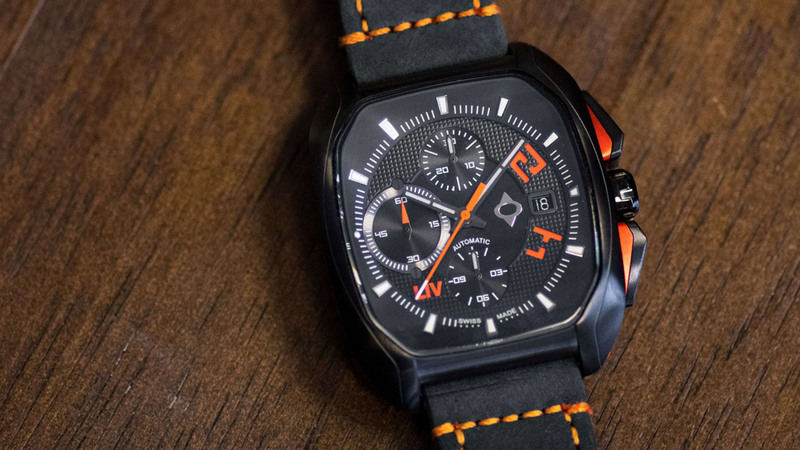 Inside this uniquely shaped, silky smooth case is the challenger to the most popular automatic chronograph in the world, the 25-jewel Sellita SW500. This contender for the crown puts automatic movement splendor on your wrist at an amazing price. The Rebel-AC inherits all the characteristics that make LIV Watches the best value in Swiss timepieces. Premium materials; 316L stainless steel for cases and bracelets, high-grade anti-reflective sapphire crystals, and hand-curated leathers for watch straps. 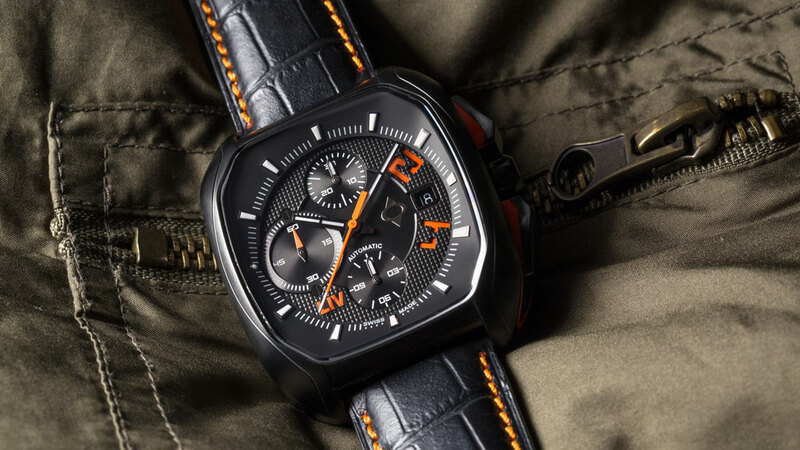 All are skillfully mixed into a flawless watch that stands out from the crowd as a rebel should. Built for performance and longevity, let the Rebel-AC time your life of adventures. Finally I received my Rebel AC #46 of 500. Was the wait worth it? **** yeah! After wearing the Rebel AC for the past 3 weeks I’m completely blown away! When I first unpackaged it I thought “****! This watch has some weight to it!” But after wearing it, it carries its weight so well and is so comfortable to wear. I really love how the sapphire crystal glass follows the curve of the case, just stunning! 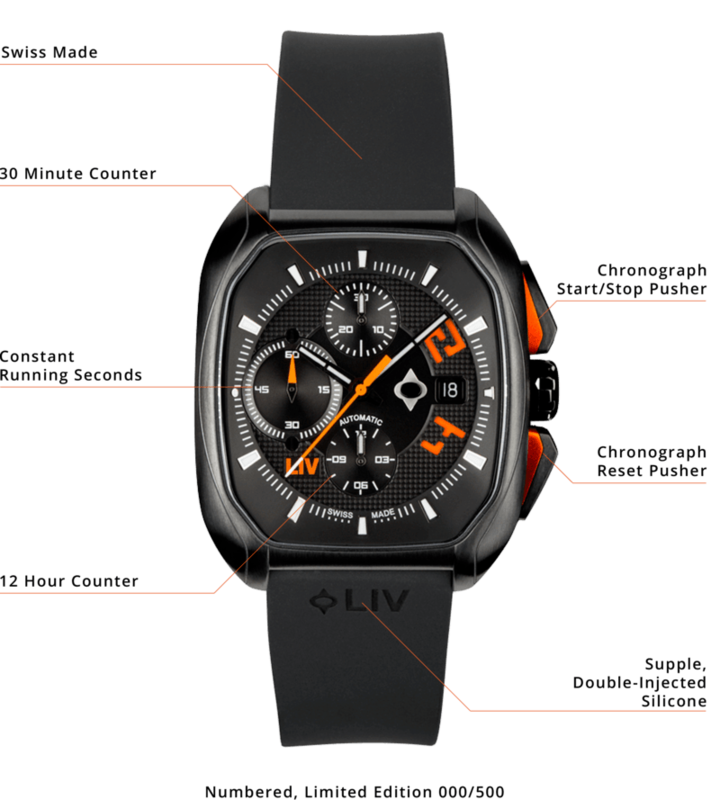 Big congratulations to LIV and their team for creating such a rebellious watch! Did I mention how comfortable it is to wear? Rebel Yell, I want more, more, more! Absolutely love my new Rebel, looks strong, original, striking, casual and eye catching! Keep it coming LIV, quality at such a great price, keep exciting your customers! Simply put, I love my new LIV Rebel-AC. Everything about it suggests quality, craftsmanship and attention to detail. The finish is excellent, the detail in the watch face is superb. But must of all, I love the subtle curve to the case that makes it fit perfectly. Even the presentation box feels like one you'd get with a watch that costs thousands of pounds! Congratulations LIV - you've designed and built a truly excellent watch and I'm delighted to be lucky enough to own one.